I saw this via Jon McWade – publisher of Before & After Magazine, a great resource for designers. Not only is it a great ad in terms of production but also a great message to remind us of the importance of wearing a seat belt. We had the opportunity to create the artwork for the debut EP Proclaim for the band Fir Hill. We created a variety of concepts and the band chose one of our favorites. 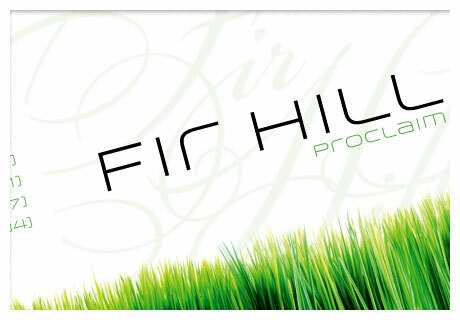 See all the options and the final artwork in our print portfolio and check out Fir Hill on iTunes. This video boils over with creativity inside of constraints. Stop Motion + Lite Brite + Origami + David Crowder* Band = one incredible video. Also be sure to check out the Making of videos. Have ideas but need help? Many times our clients come to us with great ideas but they don't have the time or the ability to implement them. Let us partner with you to make your ideas shine! Are you a small business? We love to work with small businesses – heck, we’re one ourselves! If you have a project you're ready to launch with us you'll want to complete our creative brief form. Completing this exercise lays the ground work for success. Click read more below to get started. Gitgan Media developed a beautiful, creative design that not only enhanced our concept but women immediately identified with the message in it’s simple form. Everything from the colors, to the movement of design expressed the concept we hoped for. "Gitgan Media developed a beautiful, creative design that not only enhanced our concept but women immediately identified with the message in it's simple form." Sometimes we learn without making mistakes. Other times we're not so lucky. Here's a short story about one of those times for me. © 2011 Gitgan Media LLC. All Rights Reserved. Contact us at: (234) 542-0859 or send us a message .